It is sad to report but there has been a cold war waged against (unnamed) against Guy McPherson but without reference against Sam Carana and the Arctic Blog who work has been cited frequently cited by numerous publications. And a day or so before that. The following article by Guy is from today. 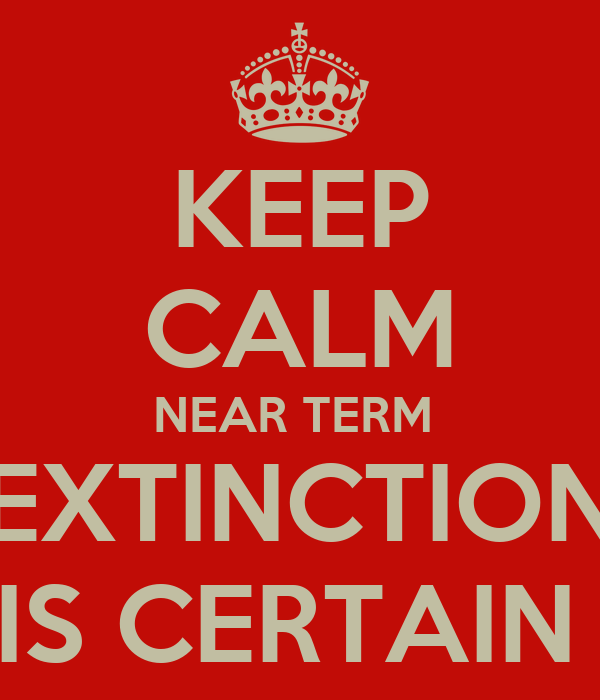 People often ask why I speak and write about abrupt climate change leading to near-term human extinction. If we can’t fix it, why bother knowing? It’s unclear who we are or what it means to fix this particular predicament. Actually, people more frequently send me hate mail accusing me of profiting by lying about our demise than asking questions with civility. It’s analogous to claiming a fire lookout gets paid by the number of fires she spots. I wish. I wish I were lying. I wish I were profiting. I’m not. I have no idea why I am compelled to defend my conclusions, all of which are supported by abundant evidence. I suppose my inner teacher believes I can overcome profound, willful ignorance with evidence. This thought alone indicates my unrepentant optimism regarding the human condition. Few people accuse their oncologist of profiting after she issues a fatal diagnosis. Once the patient recovers from the shock, he sometimes thanks the honest doctor. And if said medical doctor misunderstands the evidence and offers an incorrect, hopeful diagnosis, then filing a legal claim of malpractice is warranted. Indeed, it’s expected in the United States, the most litigious society in the history of the planet. I pursue and promote the truth, based on evidence. The evidence comes primarily, and almost exclusively, from the very conservative refereed journal literature. I’m not referring to my truth, a notion rooted in the naively postmodern palaver that we each have our own truth, and that each version of the truth is equally valid. Nor am I referring to the evidence-free religious concept of Truth rooted in patriarchy. My detractors include unscientific people afraid to face evidence, lovers of the omnicidal heat engine known as civilization, and others who lack the credentials necessary to collate and organize relevant evidence. Few people turn to their plumber for advice about cancer. Yet many people seek and believe diagnoses about climate change from wholly unqualified sources. I’m routinely accused of horrible intentions and terrible acts. There is no supporting evidence. None is needed when the hate is spewed online from a culture dominated by willfully ignorant, small-minded people with questionable intelligence writing for an audience with similar talents. I won’t even venture into the topic of trolls paid to promote disaster capitalism at every cost. Were I better-known, I suspect I’d make the list of finalists among the most-hated people in the world. It’s a goal, in any event. That’s a joke, fools and trolls. If I don’t point it out, every time, it’ll be turned against me. As I’ve been saying for years, people are stupid. Most of ’em, most of the time. Among the offenders are offensively ignorant and ill-informed, office-bound modelers who inexplicably believe field observations ought to fit models, rather than the reverse. Among the worst offenders are armchair prognosticators with video cameras and the ability to post online their ever-changing opinions unattached to evidence. Field observations and refereed journal literature are anathema to those who promote the dominant narrative. The latter notably include the folks who benefit from the omnicidal heat engine affectionately known as civilization. The best critique of my work is a three-year-old series of ad hominem attacks disguised as a blog post. It was written by a self-proclaimed science educator without a Ph.D. degree. No thought is given to his lack of credentials, his motives, the unprofessional quality of his analysis, or the dated nature of his work. Other critics post on blogs or selfie videos, presumably to counter the hundreds of journal articles on which I rely. My work relies upon evidence. It is rooted in reason. I am a rationalist. Contrary to the cries from my critics, ever eager to attack the messenger rather than evaluate the message, I am not mentally ill. The entire culture is insane. The inmates, who are operating the asylum, believe they are the sane ones. I’ve been deemed insane since voluntarily leaving my high-pay, low-work position at a major research university. Taking action based on principle, rather than money, seems crazy to people afflicted with a bad case of the dominant paradigm. In contrast to my critics, I do not benefit from my work in any way. It has cost me thousands of dollars for every dollar I’ve received in return. It has cost me the ability to do what I love. It has cost me everybody I loved from my former life. I am motivated by evidence, as I wrote two years ago. In presenting the results, in simple language, I make the evidence accessible to the public. For this, I am insulted. My work is disparaged. I am attacked incessantly. My attempts to respond kindly sometimes fail, although I can and do distinguish between being nice and being kind. In contrast to the mass of humans I encounter, I recognize niceness and kindness are sometimes mutually exclusive. The essay linked above from two years ago is sufficient. It lacks discussion of my inner teacher, constantly struggling to get out. I’ve written and spoken extensively about that topic. No further elucidation is warranted. Indeed, no further elucidation is warranted regarding my extensive body of work. None will suffice for those who deny evidence. I will continue my attempts to disengage from discussions operating strictly within an evidence-free zone, recognizing that such a step will nullify nearly every prospective conversation. Hatred will continue to flow my way not because of evidence, but rather due to the opposite: It is more comfortable to deny evidence than to ponder one’s own death. The processes of cultural “dumbing down” and acceptance appreciation of ignorance and stupidity have led to our demise. How could it have been otherwise? The usually slightly unhinged Humpty Dumpty gives a reasonaby balanced synopsis. It is time for an update. More adventures with my health. About ten days ago I woke up with pain in my right gluteal muscle so severe that I have been increasingly unable to sit on a chair other from a few minutes at a time. I had three acupuncture treatments which very uncharacteristically seemed to exacerbate the situation. By the time I saw my chiropractor my pain levels were 9/10 and he sent me for an x-ray which indicated “mild to moderate osteoarthritis is seen at both hip joints with mild superior space narrowing but more predictable osteophytes at the joint margins and the femoral necks”. The pain became so intense in my gluteal muscle that I went to the after-hours and was prescribed me with morphine. Since then the intensity has gone down a little bit but in its place I have experienced nausea (and at one point), vomiting. The morphine also makes me drowsy so any thought of seriously following the news and working on my blog is mostly fat from my mind. Of course, underlying all of this are longstanding conditions, both diagnosed but most not diagnosed that have with with me now for 5-6 years so I have enough empirical knowledge to know that like earth systems its all downhill with my health. I will write more (and also resume my blog) when I feel a bit more comps mentis and comfortable in my body. 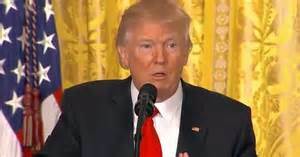 President Trump confirms during marathon press conference that his priority before negotiating with the Russians is to shore up his position at home. He has taken a first step towards rooting out his opponents in the intelligence community by asking the Justice Department to instruct the FBI to undertake a criminal investigation of the leaks which brought down General Flynn. President Trump’s gigantic sprawling 77 minute press conference was – as is always the case with him – a bravura performance that left the media reeling. Amid all the fire and thunder – which included denunciations of the media and warm and supportive words for General Flynn – it did however reveal some important things. Firstly, Trump confirmed that the decision has been made to roll out a new ‘travel ban’ Executive Order next week. This is a sensible step, clearly made following legal advice from the Justice Department, and follows logically from the Judgment of the appeal court of the ninth circuit which I have analysed previously. The two most important things to come out of the press conference are however (1) that President Trump still wants a detente with Russia, and is aware that the plotting against his administration is intended to make that more difficult; and (2) that – as I predicted – he has asked the Justice Department to instruct the FBI to carry out a criminal investigation of the leaks which led to General Flynn’s downfall. Trump’s belief that the Russians doubt that because of the domestic opposition he faces he is capable of delivering on a deal he agrees with them is undoubtedly right. It is interesting that Trump himself realises it. It shows that Trump’s priority at the moment is to shore up his position at home before he negotiates with the Russians. As an experienced deal-maker he clearly does not want to be put in a position where the Russians doubt that he is able to deliver on what he promises, and this explains why negotiations with the Russians have been put back. Washington (CNN)President Donald Trump gave lengthy news conference Thursday, a last-minute addition to the schedule, where he announced his new selection to lead the Labor Department, Alexander Acosta. His back-and-forth with reporters touched on everything from his critique of the media, his Electoral College margin of victory, the workings of his administration, former national security adviser Michael Flynn's resignation and more. "The leaks are real, the news is fake." "I want to find a friendly reporter." "I was given that information, I don't know." "I'm not ranting and raving, I'm just telling you you're dishonest people." "Obamacare, they fill up our alleys with people you wonder how they got there." "You can talk all you want about Russia -- which was all a fabricated fake news ... It is all fake news. It is all fake news." "I don't think he did anything wrong. If anything, he did something right." "The thing is he didn't tell our Vice President properly and then he said he didn't remember... that just wasn't acceptable to me." "I'd be a pretty good reporter." "The greatest thing I could do is shoot that ship that's 30 miles offshore right out of the water. Everyone will say, "Oh, it's so great, it's so great. That's not great." "Nuclear holocaust would be like no other. They are a very powerful nuclear country and so are we. But if we have a good relationship with Russia, believe me, that is as good thing, not a bad thing." "We had a very smooth rollout of the travel ban, we had a bad court." "There are two Chicagos, as you know. One Chicago that is incredible, luxurious and safe. There is another Chicago that is worse than almost any of the places in the Middle East that we talk about and that you talk about on the news." • Cashmere Primary is closed. • The first fire — believed to have been caused by an electrical problem — began on Monday, along Early Valley Rd in Lansdowne. By 7pm, crews were battling a second blaze on Marley's Hill, south of the city. Authorities don't know how that blaze began, but believe it started in a car park off Summit Rd. 1. Halswell Library 2. Selwyn Events Centre in Lincoln 3. Te Hapua Halswell Centre, Halswell Rd 4. Nga Hau e Wha Marae, Pages Rd 5. There's also a Facebook page, Evacuation Housing, for evacuated residents to ask for help, and for people to offer temporary accommodation to those evacuated. 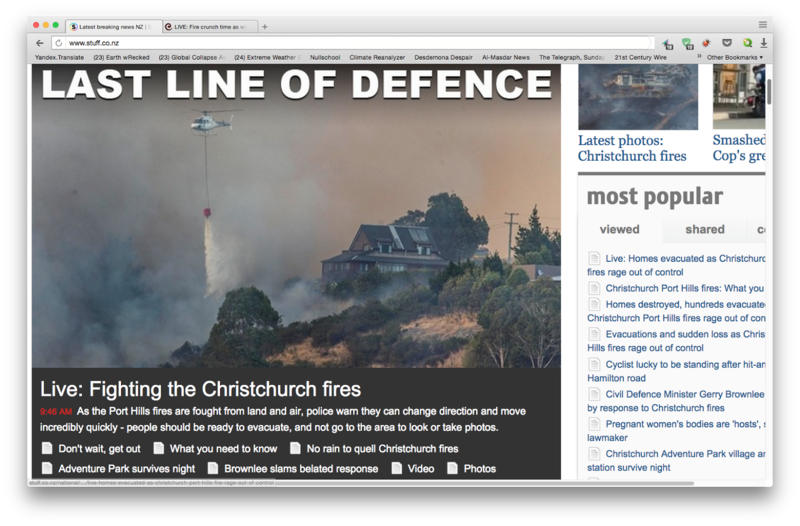 'That house that just caught fire ... that's our house"
More Christchurch homes were evacuated this morning as a huge fire burned on the Port Hills, and at least five helicopters with monsoon buckets were dispatched at first light. Overnight, the two main fires merged into one large blaze in excess of 1850 hectares and was growing. Latest reports that it has now spread to the harbour side of Sugarloaf. Police inspector Derek Erasmus said the force of the fire overnight was frightening. About 100 houses are without electricity power this morning. Lines company Orion said the focus today was on ensuring the power supply to water pumping stations near the fire to keep the water pressure up. 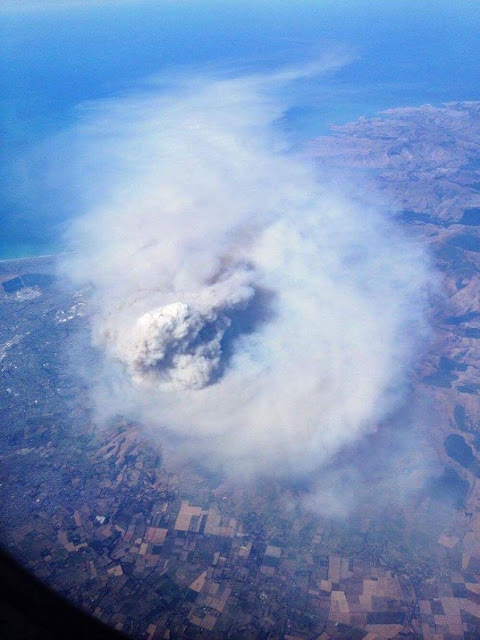 Christchurch civil defence controller Dave Adamson told Morning Report the weather forecast was not good for firefighting, with winds expected to develop this afternoon. If there were shifts in wind direction other areas could be in the line of the fire. About 450 houses have been evacuated with anything up to 1000 people having left their homes, he said. Parts of Cashmere Hills, Westmorland, Cracroft and Early Valley Road were evacuated last night. Seven houses are believed to have been damaged by the fire since yesterday, on Early Valley Road and Worsley Road, civil defence said. That was an update to a civil defence report last night that three homes had been destroyed on Worsley Spur in addition to five confirmed destroyed on Tuesday and Wednesday. The Fire Service said a total of 15 helicopters and two fixed-wing aircraft will be used to fight the fire from the air today, and more than 200 firefighters will be on the ground. Prime Minister Bill English has cancelled his events today to fly to Christchurch. Civil Defence Minister Gerry Brownlee, who heading to Christchurch, said the situation was "getting pretty serious". Mr Brownlee is expected to meet the mayors of Selwyn and Christchurch this morning and be briefed on the emergency response. "Trump's brain" meets "Putin's brain"